Em's Knitty Corner: Sick, but still knitting! I have been at home the last 2 days with a throat infection. I'm going back to work tomorrow. My doctor didn't really want that, he would have preferred I stayed home the whole week. I can't say I wouldn't have liked that. But the problem is I'm still in my trial period and so long times of illness can get me fired, plus I don't want to put this pressure on my colleagues as they have to take over the children I normally have in therapy. So it's back to work tomorrow, supported by really heavy antibiotics. I did get some knitting done, it's not that I'm that tired. But I did rest most of the time. 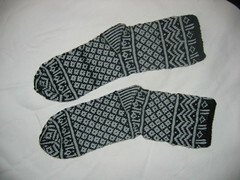 First of all, the finished Mamluke socks from Folk Socks by Nancy Bush (do I really need to link this book? :D). I finished them last week. I loved knitting them. Mods : I made the foot quite a bit longer then the pattern stated I would need. Do I have long feet or what? :D Apart from that I just followed the pattern! Now as said I'm going to try again to get some of my stash moving. I need to get stuff out in order to get new stuff in. I want to order a few books, and some yarn, but I can't as long as I don't get any new money in. So if you are even remotely interested, let me know. I'm offering 2 boxes of sock yarn up for sale. Each box will go for $50 plus $7.5 shipping. I am willing to consider a swap, let me know if that would interest you more. All sock yarn is stored in a smoke free environment. It's all unused. It'll fly priority. Each box has one skein of Opal cotton, one skein of Opal, One skein of Online Nepal, one skein of Online (various), 2x50g of Regia, and 2x50g of my own handpainted (regular sock yarn). So that makes a total of 6 pairs of socks. Off now, to some more knitting and relaxing on the couch. Oh! The Mamluke socks are great - I've been wanting to make them for a long time. 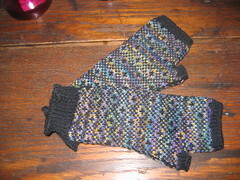 And the Endpaper Mitts look wonderful! I'm very interested lately in using a variegated/striping yarn for background and a dark solid for pattern to get a kind of stained glass look - it's great to see it in action! I found your blog through a comment on the Hello Yarn review for the Louet Victoria wheel. I'm glad to find another spinner in Belgium. I haven't looked much, but it was nice to find you. I also got a small question. Where do you find your spinning fiber? I think the use of variegated yarn worked great!